Climate Code Red: Rethinking a "safe climate": have we already gone too far? In a draft of a new research paper, NASA climate chief James Hansen and his collaborator Makiko Sato has opened a new debate about what might be the conditions for a safe climate; that is, one in which people and nations can continue to live where and as they have been, with secure food production, and in a bio-diverse environment. "... we conclude that, with the global surface warming of 0.7C between 1880 and 2000, global temperature in year 2000 had returned, at least, to approximately the Holocene maximum." "Global temperature increased 0.5C in the past three decades to a level comparable to the prior Holocene maximum, or a few tenths of a degree higher." "Summer melting on lower reaches of the ice sheets and on ice shelves introduces the "albedo flip" mechanism. This phase change of water causes a powerful local feedback, which, together with moderate global warming, can substantially increase the length of the melt season. Such increased summer melting has an immediate local temperature effect, and it also will affect sea level." "... the stability of sea level during the Holocene is a consequence of the fact that global temperature remained just below the level required to initiate the "albedo flip" mechanism on Greenland and West Antarctica. "...the world today is on the verge of a level of global warming for which the equilibrium surface air temperature response on the ice sheets will exceed the global mean temperature increase by much more than a factor of two." "... even small global warming above the level of the Holocene begins to generate a disproportionate warming on the Antarctic and Greenland ice sheets. " "Polar warmth in prior inter-glacials and the Pliocene does not imply that a significant cushion remains between today's climate and dangerous warming, rather that Earth today is poised to experience strong amplifying polar feedbacks in response to moderate additional warming." "Sea level rise potentially sets a low limit on the dangerous level of global warming. Civilization developed during a time of unusual sea level stability. Much of the world's population and infrastructure is located near current sea level." "... the fundamental issue is linearity versus non-linearity. Hansen argues that amplifying feedbacks make ice sheet disintegration necessarily highly non-linear. In a non-linear problem, the most relevant number for projecting sea level rise is the doubling time for the rate of mass loss. 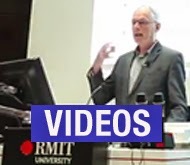 Hansen suggested that a 10-year doubling time was plausible, pointing out that such a doubling time from a base of 1 mm per year ice sheet contribution to sea level in the decade 2005-2015 would lead to a cumulative 5 metre sea level rise by 2095. " Here Hansen repeats his view, first published in 2007 but widely ignored, that a 5-metre sea-level rise is possible. In fact, recent research by Blancon et. al published in Nature in 2009, examining the paleoclimate record, shows sea-level rises of 3 metres in 50 years due to the rapid melting of ice sheets 123,000 years ago in the Eemian, when the energy imbalance in the climate system was less than that to which we are now subjecting the planet. 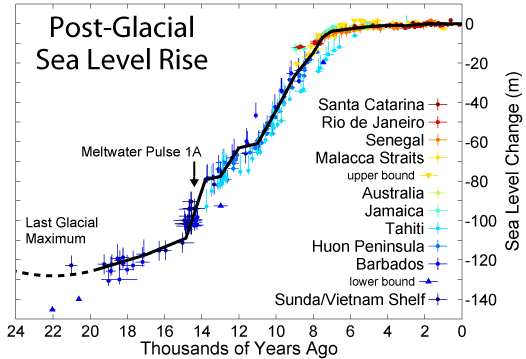 So what evidence do we have of Hansen's and Sato view that sea-level rises will be non-linear? "The most reliable indication of the imminence of multi-meter sea level rise may be provided by empirical evaluation of the doubling time for ice sheet mass loss. " "These data records are too short to provide a reliable evaluation of the doubling time, but, such as they are, they yield a best fit doubling time for annual mass loss of 5-6 years for both Greenland and Antarctica, consistent with the approximate doubling of annual mass loss in the period 2003-2008. There is substantial variation among alternative analyses of the gravity field data, but all analyses have an increasing mass loss with time, providing at least a tentative indication that long-term ice loss mass will be non-linear.... We conclude that available data for the ice sheet mass change are consistent with our expectation of a non-linear response, but the data record is too short and uncertain to allow quantitative assessment. The opportunity for assessment will rapidly improve in coming years if high-precision gravity measurements are continued. 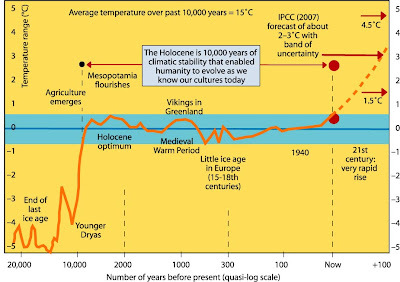 "... temperatures in the Eemian... were less than 1C warmer than peak Holocene global temperature"
"... global temperature was only slightly higher in the Eemian and Holsteinian interglacial periods than in the Holocene, at most by about 1°C, but probably by only several tenths of a degree Celsius. ".. some paleodata suggest rates of sea-level rise perhaps as high as 1.6 ± 0.8 metres per century and sea level about 4-6 metres above present-day values." "...in the early Pliocene, when sea level was about 25 metre higher than today, was only about 1C warmer than peak Holocene temperature." Whilst atmospheric CO2 amount in the Pliocene is poorly known, a typical assumption, based on a variety of imprecise proxies, is 380 ppm, or less than today's level!! "...goals of limiting human-made warming to 2C and CO2 to 450 ppm are prescriptions for disaster." "Earth at peak Holocene temperature is poised such that additional warming instigates large amplifying high-latitude feedbacks. 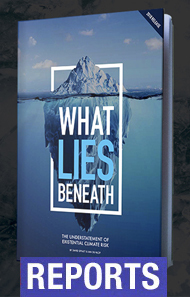 Mechanisms on the verge of being instigated include loss of Arctic sea ice, shrinkage of the Greenland ice sheet, loss of Antarctic ice shelves, and shrinkage of the Antarctic ice sheets. These are not runaway feedbacks, but together they strongly amplify the impacts in polar regions of a positive (warming) climate forcing... Augmentation of peak Holocene temperature by even 1C would be sufficient to trigger powerful amplifying polar feedbacks, leading to a planet at least as warm as in the Eemian and Holsteinian periods, making ice sheet disintegration and large sea level rise inevitable." "Earth today is poised to experience strong amplifying polar feedbacks in response to moderate additional warming." How about we buy a chunk of Northern Canada on the impending lush arctic coast? ah, Siberia - the new Riviera. "These are not runaway feedbacks, but together they strongly amplify the impacts in polar regions of a positive (warming) climate forcing... "
Makes me ask about the potential of runaway feedbacks: specifically methane release from tundra & methyl-hydrate deposits. Perhaps this discussion about sea level rises is missing the point that a runaway rise in global temperatures with the end of photosynthesis in the tropics is a real possibility or would you disagree? 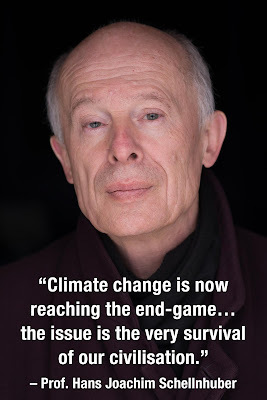 It is incredibly difficult to read such dire predictions, and look at the current social attitude to climate change without responding with cynical black humour. However that is not the most useful response. The call to action should be clear to all, and surely this information highlights even more clearly why addressing short lived atmospheric gases and forcing agents such as methane and black carbon, both produced in large quantities by the global agriculture industry, must now be considered a priority. Ending government subsidies to the worst of these practices, and support of zero emissions carbon draw down agricultural practices is key to immediately lowering the current temperature forcings. It would be incredibly ironic if the climate movement's unwillingness to pick this issue in time lead to success in decarbonizing the technology of the world only to find we failed to halt climate change because of our collective addiction to hamburgers! One of the interactive feedbacks – known mostly to scientists - is that of the decay of peat bogs due to elevated CO2 ppmv. Back in the early '60s, with CO2 at around 315 ppmv, peat-bogs' output of Dissolved Organic Carbon (DOC) into streams, from whence it readily outgases, was observed to be rising at about 6% per year. Being a global phenomenon the cause was plainly atmospheric, but no mechanism could be identified to finger any particular agent. That 6% exponential growth has continued through the decades. Finally in 2003 a Dr Foreman of Aberystwyth University cracked it, with his researches being published in Nature. The mechanism is of one peat-living microbe enjoying a population boom reflecting rising CO2 levels, and another having a similar boom by consuming the first by means of an enzyme that happens to dissolve the carbon out of peat. Dr Foreman also reported that if CO2 were to continue its rising trend, then by about 2065 the peat bogs’ DOC output would equal the entire anthro-carbon output for 2003. This is of course a relatively minor feedback, notable for responding to CO2 rather than to its resulting warming. By comparison, forest wildfire has a far greater impact already - e.g. the 30 million hectares burnt in Russia in 2010, plus the drought dieback in the Amazon (that reportedly equalled US carbon emissions) plus US & Canadian fires due largely to warming-driven pest infestations. Yet these weather event fire-disasters are in turn small beer to the ongoing year on year decline of the cryosphere and the loss of albido, that has recently been reported as posing a forcing equivalent to about one third of total global anthro-CO2 outputs. Without quantifying permafrost or clathrate outputs, from the above points I'd draw a few conclusions. First, the DOC feedback was first observed with warming at or below 0.5C, so this temperature seems a bit hasty as a strategic goal. Second, since all of the feedbacks are mutually interactive, that is, acceleration by any will accelerate all, there seems no serious prospect of a successful ending of anthro-emissions preventing them from advancing to the point of filling the natural carbon sinks and thereafter going 'runaway'. (A qualification here: they may have already exceeded the sinks’ annual intake). Short of some catastrophe of sufficient clout to shut industry, we'd plainly do very well to achieve and fulfil a commitment to end GHG outputs by 2040, which would give the feedbacks 29 years of continued 'pipeline' warming, plus the additional forcings of our declining emissions, of the removal of the global aerosols veil, and of the declining marine carbon sink. All of which points to the simple fact that geo-engineering, both in terms of carbon recovery and albido restoration, is not optional - it is now essential if we are to control the feedbacks from utterly dwarfing anthro-GHG outputs. And it is up to us whether to help ensure it is done well, rather than being abused as a mere offset and being applied via unsustainable techniques. As a third conclusion I'd point to the present crisis demanding a coherent proposal for the framework of the climate negotiations. The rate of advance of the threats is such that no peicemeal voluntary agreements are going to get anywhere near the rate of decarbonization that is required. Collective global action remains the imperative. On this that great Australian Professor Garnault has written astutely - The framework he describes is called Contraction and Convergence, and I'd urge any who've not studied it to do so. It is the banner that we need as a rallying point for a global N-S movement, by which we should put an end to futile demands that politicians 'do something' or at least pay lip-service to some dubious 'safe' number of ppmv or degrees C.
Until we have a specific demand for the basis of the burden-sharing that the climate treaty requires, why should politicians take us seriously ? global temperatures. This completely obscures the reality that temperature changes in the high latitudes are far greater than 1C - why else are the iecaps melting? - but the use of 'Average global temperature' has an anodyne effect - especially on doubters and politicians - "what only 1C?? - what's your problem sir?" 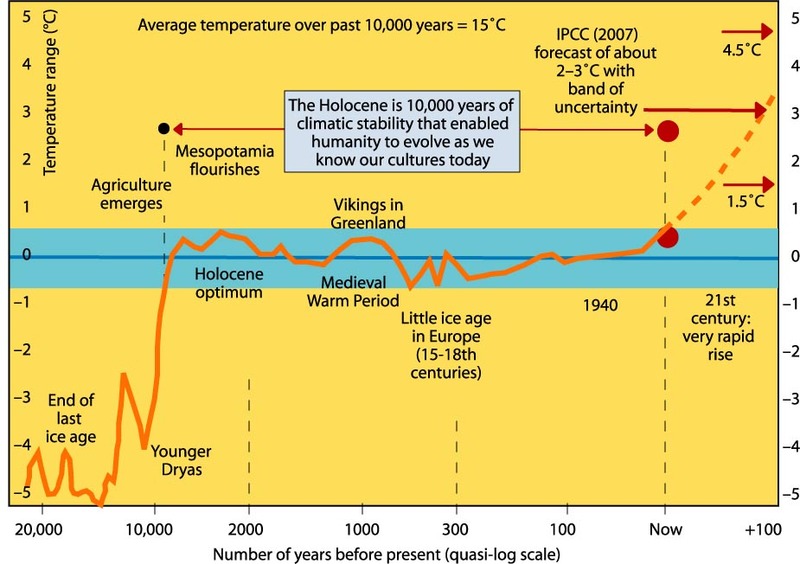 It would be nice to have the first figure on a consistently scaled x-axis and with the most likely 21stC rises of 4ºC+ included (perhaps as range) so that people could grasp in an instant just how constant the climate has been for the entire period of human civilisation and just how far we are departing from it. I just bought a house at sea level 2 miles from the ocean. Should I build a dock? 5000 years ago the West Antarctic Ice Sheet collapsed catastrophically, at a global temperature of 14.44C, with a 7 metre high global flood. ( The Noach legend was real according to Andrill Ice Cores ). The sudden sea level rise set off volcanic eruptions / a volcanic winter, which reduced global temperatures and re-froze WAIS. We must cut carbon emissions by 80% directly, to avoid 400ppm meltdown.